What was the cutting built for? The Miramar wharf was built in 1901, promoted by C.J Crawford and A.D, with other landowners of course, were anxious to give Wellington buyers at their land sales. The Miramar ferry company was formed and ran the two ferries, Royalty and Admiral between the city and three wharves on the Miramar Peninsula. 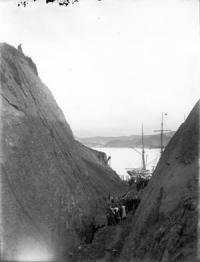 From the Wharf, a deep cut was dug to make easy access to the land ahead. It was also built to make repairing boats easier, with the dock being so close.